Believe it or not, eating to lose weight fast is not complicated at all when you combine the principles of eating for fat loss and common sense healthy eating guidelines. What are the principles of eating for fat loss, you ask? Basically, to eat plenty of fresh vegetables eaten raw or lightly cooked and include protein-rich foods (like lean poultry, beef, fish, eggs, low-fat cottage cheese, beans, nuts, seeds) at each and every meal. Also, to cut drastically on foods high in sugar and starches (sweet fruits, pasta, white breads, pastries, full-fat milk, soft drinks, etc). 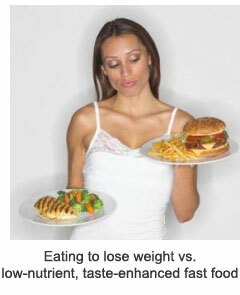 But there’s more to the strategy of eating to lose weight quickly. Here are three simple eating tips along with some little-known information on what should never be a part of your healthy eating. Have you ever wondered why genetically modified, taste-enhanced, chemically treated, artificially-colored foods are promoted aggressively through ads all over the marketplace? Decades ago, when convenience (rather than health) was the norm, frozen food, aluminum cans and pans, plastic containers quickly invaded your parents’ or grandparents’ kitchen. And, if you are like most overweight people you too have been used to eating frozen food products and “fast foods” loaded with trans fats, high-fructose corn syrup, synthetic sugar replacements, preservatives… but completely missing essential nutrients. Yes, this certainly serves well the food industry wanting to sell as much processed food as possible for the biggest profits… But it doesn’t serve YOU. In fact, for the most part, these foods wreck your health and make you fat. Because your body stores the toxins from preservatives and processed foods in your fat cells, to stop them from circulating freely in your system and making you sick. So, as long as your fat tissue stores dangerous chemicals from processed food products, it’s practically impossible for you to get rid of it. chemicals, so to increase their number, you must eat more. In fact, this is one of the big reasons you get unstoppable food cravings and hunger pangs… It’s almost insane, isn’t it? Your appetite decreases and the fat stops creeping up when you start eating to lose weight fast, which means eating unprocessed, fresh foods (organic is preferable, if you can). Want to avoid destroying fresh foods’ nutrients and adding more toxic compounds to your food? Then, be sure to cook them as little as possible (stir-fry is the best) using only healthy cooking oils. That’s the second (but very important) simple change you need to adopt when you start eating to lose weight quickly. Why? Because when you eat smaller quantities of food more often (every 3 hours or so), you keep your metabolic rate at its peak. Plus, the digestive enzymes in your stomach work best on smaller quantities of food. Optimally, 20-25% less than being full. When the digestive enzymes are outnumbered, digestion is impaired, the food is incompletely digested, nutrients are lost and a full array of side effects make you gain weight. 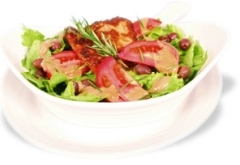 The second change among the healthy eating guidelines for losing weight is to eat around the same time each day. Otherwise, erratic eating confuses your body and your metabolism slows down, because it interprets missed meals as “famine” and the dreaded starvation physiology kicks in. You won’t believe how much more satiated you feel when your eating time is predictable for your body. Three lighter meals and two healthy snacks per day keep both you and your body well-fed and satisfied. Lastly, the third change when you start eating to lose weight quickly is chewing more. Did you know that chewing starts the digestion? It’s true. The foods you eat are broken down physically through chewing, and chemically by saliva. If you don’t chew enough, you produce too little saliva, and the food is not broken down properly. The result? Your stomach is forced to overwork, becomes overstretched, and sends signals of hunger, making you to eat more than you would normally eat. This might be a new idea to you, but there are certain things that trigger a fat-storing physiology vs. a fat-burning physiology. You’ll want to avoid as much as you can these alimentary weight gain triggers – not only to protect your health, but also if you’re committed to eat healthy to lose weight easier and faster. If you want to stop overeating and end your resistance to burning body fat, eating to lose weight fast should become a priority. This means to favor fresh (organic if possible) fruits and vegetables, raw nuts, quality meat and low-fat dairy products coming from grass-fed animals free of medication and hormones. That’s because these are transferred to your body causing high toxicity, hormonal imbalance and ultimately, weight loss resistance. In closing, you should know that while eating to lose weight fast is paramount, there are other factors that trigger a fat-storage physiology as well: lack of sleep, a sedentary lifestyle, chronic stress are just a few… There are a few other things to look at if you eat well but are still not able to lose weight.